Successfully Added ECT 50 Vape Mod Kit - 2200mAh Battery, 2.5ml Glass Tank, 5 - 50 Wattage Range, Rebuildable Atomizer And Tank, 510 Thread to your Shopping Cart. The ECT 50 Vape Mod Kit is a little starter’s kit that is perfect for all beginning vapers out there. Packing all that’s needed to enter the world of vaping and featuring an easy to operate design, this electronic cigarette is the perfect vaper that introduces you to all the joy and benefits of vapors over that of traditional tobacco cigarettes. Holding a built-in and powerful 2200mAh battery, this E-cig brings along countless hours of flavorsome vaping joy – ensuring that you’ll always are ready to enjoy its great taste and engage in your upcoming vaping session whenever you feel the time is right. Along with its 510 thread connections, this E-cigarette offers countless options to fully enhance your vaping experience. Allowing you to manually adjust its output Wattage between 5 and 50W, you can be assured that this vaper brings along numerous of possibilities for you to enjoy all the benefits that electronic cigarettes have to offer. Supporting up to a 3-ohm resistance, this e-cigarette is capable of handling large amounts of Wattage, resulting in the fact that his little beauty allows you to produce extremely large vapor clouds while enjoying its delicious tastes to their absolute most. Impress friends and bystanders with your vaper skills while enjoying the tasteful experience this E-cigarette has to offer – from now on you’ll be able to take your vaping experience to entirely new heights. 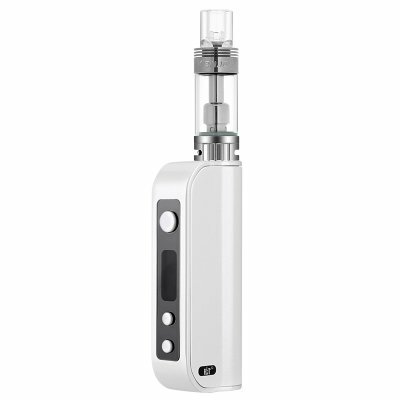 The ECT 50 Kit features a sophisticated 2.5ml glass tank that can be filled up with any vape liquid of your liking. Simply assemble the kit, pour in your favorite vape liquid, and you’ll be all set to enjoy countless hours of relaxing vaping sessions. With its sleek and stylish design, this e-cigarette has been crafted out of high-quality aluminum and stainless steel material – giving it a high-end touch and look while simultaneously making it extremely durable. Thanks to its rebuildable design you’ll be able to change your atomizer and tank at any given moment, allowing you to upgrade and pimp up your vaporizer so it will meet your exact vaping needs. Featuring a sophisticated LED display, this starter’s e-cigarette keeps you constantly updated about the current settings applied to your vaper. Easily control and keep track of your Wattage, Ohm resistance, and a whole lot more – with this LED display, you’ll be assured that your vapor is always adjusted to your exact liking. Additionally, its LED display also keeps you updated about your current battery level, ensuring that you’ll never unexpectedly run out of juice while you’re enjoying a tasteful vaping session. With its rebuildable and easy to operate design this stylish E-cigarette is the perfect vaporizer for all beginning and advanced vapors out there. Very impressed with the quality of the product, the metallic body is a definite upgrade from the eT30p, which is plastic, and of course the ECT50 is more powerful. I find the unit a little heavy in the hand, but all in all I expect a long life for the unit and is a great addition to my collection!